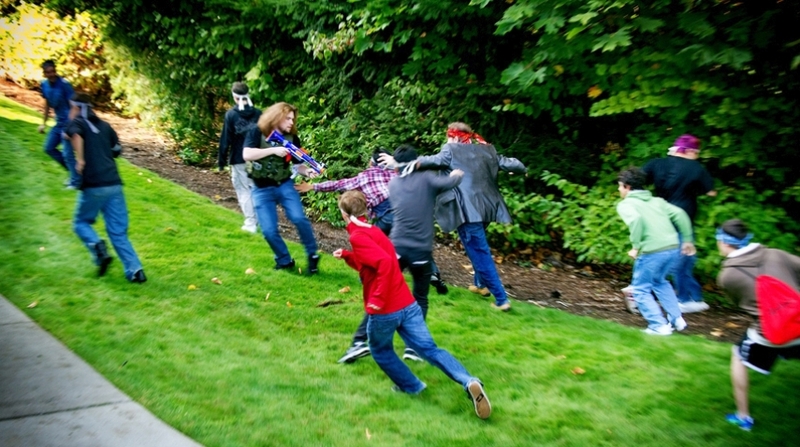 Outbreak is a massive, week-long game of zombie tag in which players must hunt, defend themselves, and complete missions all while living their everyday lives. Working on Outbreak was fascinating, as it really brought home the idea that being a designer doesn’t mean you make videogames, it means you make experiences. 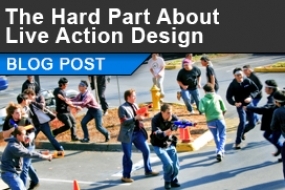 While using slightly different tools, building a live-action game utilizes the same core design muscles that I’ve used in all of my digital and tabletop products, and has even informed some of the design decisions I’ve made on triple-A titles. 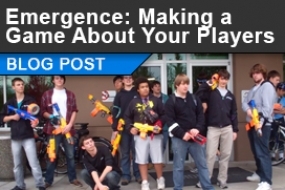 Players Played How they Wanted – The introduction of our “Reversion” mechanic allowed players to switch between teams at any point during the week, increasing retention and allowing players to play the game they want to play. Day 1 Experience Improved – The probability-driven “Starter Zombies” mechanic allowed us to more successfully predict gameplay trends in order to produce better content for our players, and minimize the need for moderator intervention and improvisation. Massive Participation Increase – We totaled 213 participants, increasing our participation level by 50% from the previous installment of the ARG. 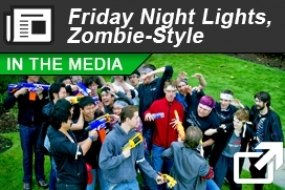 We Received Media Attention – An article was featured on geek culture website Geekwire, illustrating our efforts to evolve Humans vs. Zombies into a better-designed title focused on the memorable interactions between players. Growing Pains – After the previous installment had shipped with only three team members, this project naturally faced several growing pains after extending the team size up to 10 members, including somewhat nebulous job descriptions and lack of accountability as a result. 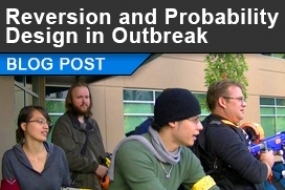 External Marketing Opportunities – I’m confident that Outbreak would make an excellent alternative to Humans vs. Zombies even outside of DigiPen’s campus. Unfortunately we didn’t have quite enough time to commit to more heavily polishing and branding our distributables for a more mass market. Working on Outbreak was expectably difficult, as much of the game’s content relies on a number of unpredictable and uncontrollable circumstances, however I felt that our team did an excellent job delivering a compelling experience regardless. Moving forward, I’ve learned to appreciate the importance of pervasive gameplay (gameplay that takes place outside of the core, intense action loop), and the fostering and maintenance of a passionate community. Each of these concepts has a lot to contribute to any game product, and I plan to make every product I ship more conducive to these ends.